Plenty was made of Twitter’s live streaming debut of Thursday Night Football heading into the Jets-Bills game on Thursday night. But Sling and Playstation Vue customers who bought NFL Network and expected to watch the game on either of those platforms were dealt a rude awakening on Thursday night – the game, and all Thursday Night Football games streaming on Twitter, wasn’t available by watching NFL Network. @Sling you have GOT to be kidding me. Day 2 of my subscription. I ordered it specifically to watch NFL games. Wtf @Sling I pay for NFL network yet you don't have the rights to play the game? The story was similar for Playstation Vue users. Hey, @NFL, what's the point of putting NFL Network on @PlayStation Vue if we can't actually watch live games on it?! @PlayStation What's the point of having PLAYSTATION VUE and NFL NETWORK if you don't even play the damn games on the channel ? 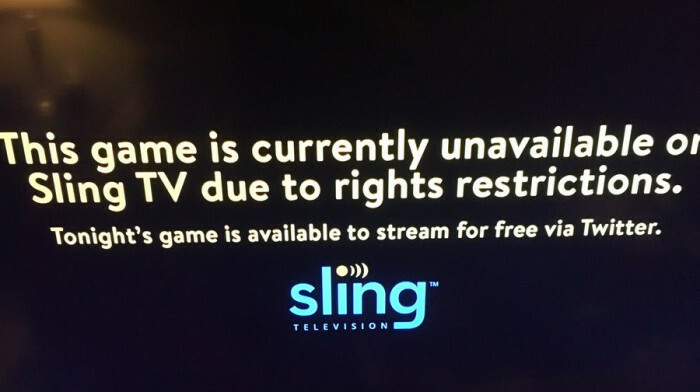 Sling’s response was simple – they don’t have the rights to the game because it’s streaming on Twitter. Sling also clarified that because the game was airing on CBS, a network they don’t offer, they also couldn’t offer the game on the NFL Network stream. Sling’s website doesn’t make these clarifications when discussing the available NFL Network programming. Live programming all-year round — watch NFL Preseason and Thursday Night Football games, comprehensive coverage of NFL events like NFL Scouting Combine, NFL Draft, Free Agency, and NFL Training Camp. Enjoy originals Emmy award-winning series and shows, including NFL GameDay, Good Morning Football, A Football Life and more! As for PlayStation Vue, they proactively tweeted before the game that it would be available for streaming on Twitter and through CBS, if available. PlayStation’s website also has a disclaimer stating that not all games on NFL Network will be available. Individual game availability depends on your location and channel lineup and is subject to blackout restrictions. This includes select games on NFL Network. Please be aware that select channels showing NFL games are not available in some areas. In order to watch a specific game, you will need to have a live feed for that channel in your city. On Demand streams will not show the games. To check what channels are live or On Demand in your city, please visit the PS Vue Plans page and enter your zip code. If I can offer a theory, it would be this – this isn’t an NFL Network game. It’s a CBS game that’s airing on NFL Network in addition to CBS. Thus, one would need to stream the game through CBS in the non-cable provider of your choosing, not NFL Network. Because Sling doesn’t offer CBS and Vue only offers CBS in certain markets, not all customers can stream the Thursday Night Football games. Got all that? Yeah, it’s pretty chaotic, and considering how much Sling and Vue promoted “watch Thursday Night Football!” in their marketing of NFL Network, customers *should* feel misled by the way things have unfolded. If we assume that the only Thursday Night Football games available for streaming on Vue and Sling are the ones that are airing exclusively on NFL Network, here are the games you’ll be able to stream: Week 4, Week 7 (Sunday morning from London), Week 8, Week 9, Week 10, Week 15 (Saturday), Week 16 (Saturday), Week 16 (Sunday). It looks like you’ll be out of luck for all of the other weeks, where the games are airing on CBS or NBC in addition to NFL Network (unless you receive either of those networks on Sling or Vue). This is what happens when streaming rights are split from broadcast rights – everything turns into chaos.